One year ago, Los Angeles Angels’ pitching coach Jim Gott visited St. Vincent de Paul with a group of baseball pitchers. The athletes spent the afternoon volunteering in the Dream Center. 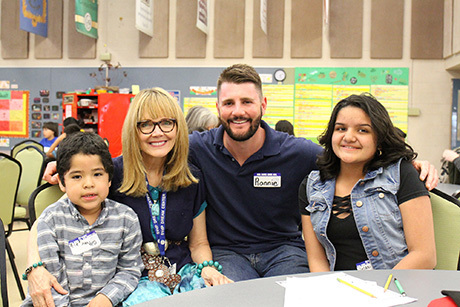 It was a one-day visit but it left a long-lasting impact on one player in particular – minor league left-handed pitcher Ronnie Glenn. Question: Tell us about your first time visiting St. Vincent de Paul. Question: What happened when the kids came in? Ronnie: Well, I can explain it this way…with all of my travels and experiences, I know when God’s presence is around me in other people. And when I first came to the Dream Center, I saw that immediately. God is here with these children. With Cynthia and the staff and volunteers. I saw that with these kids, it doesn’t matter where we come from or what we do after we leave, when we’re here with them, we’re important and we are someone they want to spend time with. I felt like I grew through that one experience. Question: How did you get started in baseball and what brought you back to Arizona and St. Vincent de Paul almost a year later? Ronnie: I grew up in South Florida and always played baseball. In high school, I got recruited to play baseball at University of Pennsylvania. During my senior year, I was drafted by the Los Angeles Angels as a left-handed pitcher and started in the rookie league. Then I spent a season in AA baseball in Iowa. I came out to Arizona in January for spring training. When I arrived in Phoenix, I was struggling with the transition a bit. Working to become a big leaguer is a process and it can feel so far at times. In the meantime, I want to provide value to something or someone. I remembered my experience at St. Vincent de Paul last year and I remember the smallest conversation with someone meant something. I wanted that again. I wanted to feel like I could give to someone just from my time. I grew up Catholic, and I knew this was where I belonged. Question: Why was the transition difficult for you? Ronnie: I think a part of it was I didn’t know my host family before coming out here. They were strangers at first and I was paying my own way to be here. I spent my off-season with my fiancée and having to say goodbye and come out here alone was hard. I would train for a few hours, but wouldn’t have anywhere else to go afterward. I wondered what was my purpose for being here. I started going to church here right away and asked God for an opportunity to serve and find a way to give of myself during my downtime. I texted Jim Gott, the pitching coordinator, to get the contact info for St. Vincent de Paul. Right away I knew God wanted me to be here. My ultimate dream is to become a big leaguer, so that I can become a role model for children to pursue their own dreams. And what a place to find along my way! Question: What was your experience like when you returned to St. Vincent de Paul? It was really eye-opening. A lot of these kids have dreams. It doesn’t matter what circumstances they come from, they have multiple dreams and they are so passionate about them. It was so great seeing them light up when they were talking about their dreams. And I loved helping these kids with their homework. To actually see a child learn in front of you is amazing. I’ve never experienced that before. When I spend time with a kid, I want them to feel like they’re the only person in the world. If they can feel that for a second, then WOW. I don't care if they forget my name in a year, but it would be great if they just remembered how important it is to give someone undivided attention and how important it is to give to others. Question: What surprised you most about volunteering in the Dream Center? Ronnie: One of the kids I tutored told me about his dream to one day be able to take care of his mother. I was speechless. That part of the volunteer experience is where I learned a lot and was so surprising. I learned from a 12-year-old what matters most. Question: What will you remember most about this experience? Ronnie: The kids here are special. They love their families and they love this place. When you’re spending time with someone who loves where they’re at, how do you not love it too? The Dream Center is a part of my dream now. I’ve had this long process of trying to become a big leaguer and I’ve met a lot of different people along the way and been to very special places. 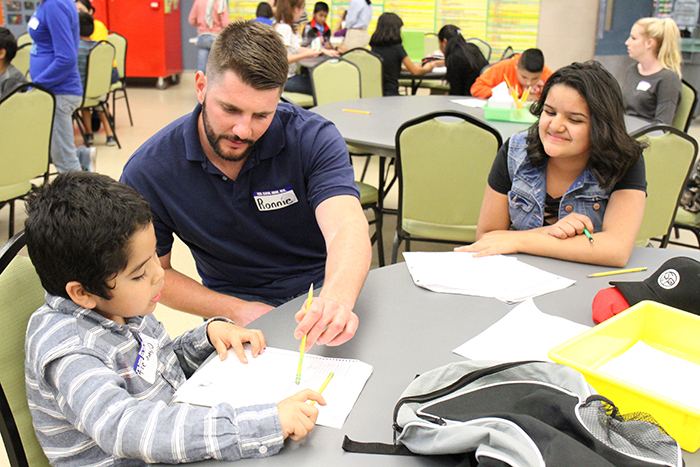 If I get to that place in my life [major leaguer], I want to give as much as I can to St. Vincent de Paul. It’s now a part of my heart.